A question music fans frequently ask when they encounter Lenny Breau’s virtuosic fingerstyle jazz guitar playing for the first time is “How is it possible I’ve never heard of this guy?”. It’s a reasonable question considering that we live in a world where even the smallest amount of talent can catapult an unknown to overnight celebrity status. Yet despite possessing musical gifts of such magnitude that Chet Atkins once called him “the greatest guitarist who ever walked the face of the earth”, Lenny Breau spent most of his professional life in relative obscurity. The dazzling guitar style that so impressed Atkins was a unique synthesis of jazz, flamenco, country, classical and other musical genres that Lenny worked tirelessly to refine throughout his life. Along the way, he created new techniques that baffled and amazed even the most accomplished guitarists of his time. The musical result enthralled listeners as much for its technical complexity as the depth of its emotional expression. 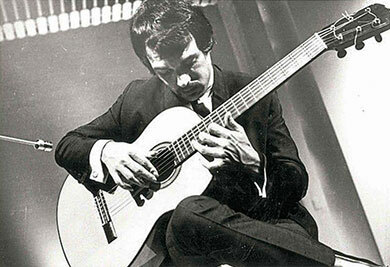 His music was captured on a handful of recordings that sold poorly during his lifetime but are now considered by guitar aficionados to be among the most important and groundbreaking guitar recordings ever made: masterworks of fingerstyle jazz guitar that are an enduring testimony to Lenny Breau’s musical brilliance. How is it then that such an enormously talented and innovative musician is only now—over thirty years after his mysterious death at the age of forty-three—finally beginning to receive the attention and acclaim that eluded him during his lifetime? This conundrum is perhaps best understood by looking at the life, times and character of Lenny Breau, who at an early age dedicated himself to the passionate pursuit of a unique musical voice. 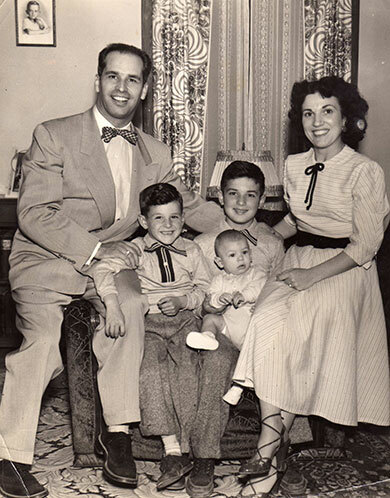 Harold Breau and Rita Coté—better known by their stage names as Hal Lone Pine and Betty Cody—had already achieved considerable regional success as Country and Western performers when their first son, Leonard Harold Breau, was born in Auburn, Maine on August 5th, 1941. At the age of three, Lenny was singing harmony with his parents on a local radio station and occasionally appearing with their stage act throughout New England. Lenny took up guitar at the age of nine or ten while living in Maritime Canada where his parents had relocated for professional reasons. Lenny learned a few chords from the son of the family with whom he stayed while his parents were on the road and was soon playing jigs and reels with groups at local barn dances. In 1957, Lenny’s parents moved to Canada to take a job with radio station CKY in Winnipeg, Manitoba. Lenny continued to play country music in his parents’ band but was beginning to learn the bebop lines of jazz guitarists such as Tal Farlow and Barney Kessel. While living in Moose Jaw, Saskatchewan where they performed on radio station CHAB, Lenny and his father had a falling out when Lenny injected jazz riffs into Hal’s country routine. Lenny left the band and he and his young wife Valerie returned to Winnipeg. He immersed himself in the city’s thriving jazz scene, jamming at various clubs with Winnipeg’s best jazz musicians. The most important of these in terms of Lenny’s musical growth was Bob Erlendson, an older, experienced jazz pianist who recognized Lenny’s talents and began to teach him jazz theory. Erlendson and Lenny began playing a regular nightly gig at the Stage Door jazz club where Lenny developed his jazz chops and applied the jazz theory Erlendson was teaching him. Lenny also continued to work on his solo guitar playing. Chet Atkins had been his musical model for nearly a decade but from 1960 onwards Lenny’s main influence was jazz pianist, Bill Evans. Lenny connected deeply with Evans’ music and would spend the next several decades transposing Evans’ sophisticated modern harmonic and melodic concepts onto the fretboard. This coincided with Lenny’s discovery of flamenco guitar, which he loved for its powerful rhythms and emotional fire. Lenny incorporated both styles into his evolving approach to solo guitar playing. In 1961, Lenny was twenty-years old. In some ways he was a sophisticated young man who had seen and experienced more of the world than most of his peers. Yet Lenny retained throughout his life an almost child-like innocence and ingenuousness that could make him appear younger than his years. These qualities coupled with an exuberant, guileless candor and playful sense of humour charmed people and would help to open doors for him professionally and socially. There was, however, a less positive consequence of his child-like demeanor. Even before reaching his teens, Lenny had devoted every waking moment of his life to advancing his guitar skills. As the “boy wonder” star of his parents’ band, nothing had been asked of him except to play his guitar for adoring fans and enjoy the inevitable applause and praise that followed. Having never been pressed to take on any responsibilities beyond practicing and performing, his basic life skills were underdeveloped and as an adult he tended to depend on friends and acquaintances to handle the mundane demands of his day to day and professional life. In later years, Lenny’s inability to look after himself would be a burden for him, particularly when his personal problems sometimes alienated those he relied on for help. But in the early days of his career there was no shortage of people who were delighted to offer guidance and support to the personable and winning young creative artist. One of the first people to give Lenny’s career a hand up was George Sukornyk, a music lover, lawyer and business entrepreneur who had driven from Toronto to his hometown of Winnipeg at the urging of a friend who had seen Lenny perform at the Stage Door. Astounded by what he saw, Sukornyk invited Lenny to be his guest at his home in Toronto where he acted as Lenny’s manager without fee for several months. With Sukornyk’s help, Lenny found his way into the Toronto jazz scene and immediately impressed local musicians. Renowned Canadian jazz guitarist Ed Bickert recalls “My first reaction was a combination of jealousy, envy, admiration – because he was so good and so original. I thought, ‘Oh my God. This guy is light years ahead of me and so many other people around here.’ ” A few months after Lenny’s arrival in Toronto, Sukornyk arranged a meeting between Lenny and jazz singer Tony Bennet. After a short audition, Bennet offered Lenny a job in his band, a plum proposition for the young musician considering Bennet’s stature. Lenny was tempted but turned the offer down and instead formed a trio called Three with bassist Eon Henstridge and singer/actor Don Francks whose novel arrangements of jazz standards formed much of the group’s material. The trio toured Ontario and Quebec before relocating to New York City. They appeared on The Jackie Gleason Show, a popular, nationally televised variety show of the time, and recorded a live album at the Village Vanguard jazz club released as No One in This World is Like Don Francks. These were all significant accomplishments for the young guitarist at this early point in his career. Francks dissolved the group when he was offered an acting role in a major stage production. Lenny returned to Winnipeg and began working in various bands with Bob Erlendson and other local musicians in the thriving Winnipeg club scene. But it was income from working as a studio musician for the Canadian Broadcasting Corporation (CBC) television and radio with which Lenny supported Valerie and their son and daughter, Chet and Melody, born in 1960 and 1962 respectively. During the next three years, Lenny played guitar on hundreds of CBC dates featuring music ranging from contemporary pop to straight ahead jazz. He was also a fixture in Winnipeg jazz and folk clubs, honing his eclectic solo style as well as working with other musicians. In 1966, Lenny hosted his own eponymously named TV show, which often featured his by now highly evolved solo guitar work. A year later, he managed to get a tape of one of his shows into Chet Atkins’ hands in Nashville. 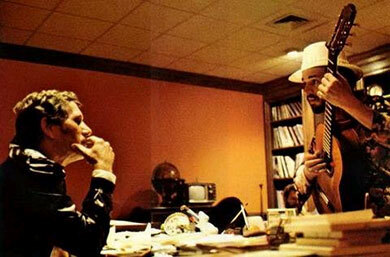 Atkins was then Vice President of RCA Records and immediately offered Lenny a recording contract. After some initial hesitation, Lenny flew to Nashville in April of 1968 to record his first album with two Winnipeg musicians—bassist Ron Halldorson and drummer Reg Kelln. 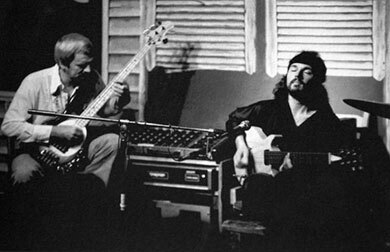 The trio recorded two albums for RCA: Guitar Sounds of Lenny Breau, which Chet Atkins produced in 1968, and its follow-up, The Velvet Touch of Lenny Breau– Live! recorded in Los Angeles a year later. On both albums Lenny played electric and nylon string guitar as well as a modified 12-string electric guitar. The material ranged from jazz, pop and country standards to flamenco, folk and Indian-influenced music. Both albums are now considered quintessential classics of the fingerstyle jazz genre. Lenny’s musical style and career had gathered momentum throughout the 1960s. Now with two albums on a major label and regular work with some of Canada’s top jazz musicians—Moe Koffman, Peter Appleyard and Don Thompson among them—he seemed poised to make a significant professional leap forward. But it was not to be. His two RCA albums sold poorly. Pop audiences found his music too jazz-oriented and his musical eclecticism was off-putting for many old-school jazz purists. Younger jazz fans drawn to the more bombastic jazz-fusion sounds of Miles Davis and John McLaughlin that defined contemporary jazz of the time paid little attention to Lenny’s recordings. The lack of attention his albums received disappointed Lenny but he did little to help their sales. He avoided meetings to discuss RCA’s promotional plans for the albums, which had included an international tour. “He just wasn’t ambitious in a commercial sense,” says Lenny’s close friend, Ron Halldorson. “He was striving to accomplish what he wanted to do as a player.” This attitude did not endear him to RCA or his manager Dee Drew. Both lost interest in Lenny and ended their business relationships with him. Lenny was now left to his own meagre resources to manage a career that was rapidly failing. His inability to look after himself and his interests was worsened by his growing drug use. In the early 1960s, like countless other people of his generation, Lenny had begun to experiment with LSD and marijuana, claiming that these drugs enhanced his creative process. But by 1970 drugs clouded rather than vivified Lenny’s mind. He began using heroin when it was available and heavy doses of methadone when it was not. Judi Singh, alarmed by his drug use, ended her relationship with Lenny and moved to Edmonton with Emily. The overdose death of a close musician friend compounded his unhappiness over the split with Judi and sent Lenny into a deep depression, which he dealt with by increasing his intake of drugs. His addiction made him undependable and clubs were reluctant to book him. He toured with Anne Murray’s band in 1972 but Murray fired him when his drug use interfered with the band’s performances. For the next five years Lenny moved sporadically from one Canadian city to another, playing small gigs where and when he could find them. For a time, he renewed his relationship with Judi Singh in Edmonton but the relationship ended when he could not adhere to Singh’s zero tolerance for drugs. Attempts at beating his addiction were short-lived and ineffective even after a court-ordered stay in rehab in Winnipeg where he was busted for heroin possession. In 1976, he did managed to kick heroin with the help of musician friends while living on a commune in Ontario. Soon after, he was busted for possession of marijuana with intent to traffic (a charge later dropped) and fled to the United States where his substance use continued while he eked out a living playing clubs in Central Maine. A year later, at Chet Atkins’ urging, Lenny returned to Nashville and began playing a nightly restaurant gig that Atkins had arranged for him. Although he continued to struggle with addiction, the next few years were relatively fruitful ones for Lenny particularly in terms of his recorded output. This included two excellent albums recorded in Chet Atkins’ home studio— The Legendary Lenny Breau: Live and Standard Brands, a duet album with Atkins. He also recorded for Adelphi Records in New York City. Adelphi’s founder Gene Rosenthal had heard Lenny play in a small Nashville club called Mississippi Whiskers. Bowled over by Lenny’s playing, Rosenthal offered him a recording contract on the spot. Lenny was hesitant but eventually went to New York to recorded material for three albums: Five O’Clock Bells, Mo’ Breau and Last Sessions. These albums have been continuously in print longer than any other of Lenny’s recordings. 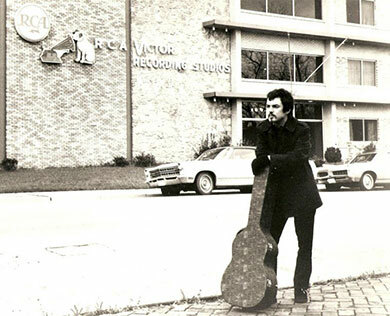 Other recordings followed, notably two country-jazz fusion albums: Minors Aloud, with pedal steel guitarist Buddy Emmons and When Lightn’ (sic) Strikes (later reissued by Art of Life Records as Swingin’ on a Seven String), an album of country standards featuring Lenny mainly on seven-string classical guitar. There were other signs that Lenny’s career was in ascendency. Scott Page, saxophonist with 1970s pop duo Seals and Crofts, brought Lenny to Los Angeles for a string of well-attended shows at local jazz clubs. In 1980, documentary movie maker Lorenzo DiStefano asked Lenny to appear in his film about Tal Farlow. Lenny jumped at the chance to meet and play with Farlow, who had influenced him as a young musician. After clearing up legal hurdles with help from his old friend Don Francks, Lenny returned to Toronto to play a string of successful dates at the Bourbon Street jazz club. The tracks on his album Live at Bourbon Street with bassist Dave Young were recorded at one of these dates and show Lenny at the top of his game. After a stint at Bourbon Street in 1980, Lenny flew to Winnipeg to kick off a five-city Canadian tour in large, soft-seat venues. Promotion and ticket sales were excellent and a large crowd turned out to welcome their home town hero. Lenny, however, was shaken over legal hassles with his ex-wife Valerie. He was inebriated when he took the stage and delivered a disastrous performance. All subsequent concerts were cancelled with the exception of Vancouver where he reprised his Winnipeg performance. Lenny returned to the United States and would never set foot on Canadian soil again. Lenny spent his last years in Los Angeles performing regularly at Donte’s jazz club. Recently released CDs of material recorded live during this period attest to the high level of his playing at that time. His audiences often included top jazz guitarists such as Pat Metheny, Larry Coryell and Phil Upchurch, who asked Lenny to play on an album he was then recording. This led to Upchurch’s label offering Lenny a recording contract and a tour with Upchurch was under discussion. Despite this recognition by his peers his audiences were relatively small. According to jazz drummer Joey Baron, LA music fans had little interest in Lenny’s music. “[LA’s music scene] was sedate and non-challenging and had nothing to do with artistry”, say Baron. “Lenny always wanted to take risks and we were raw and emotional. It took a lot of guts for him to play that way…”. Most of Lenny’ income during this period came from teaching privately and at The Guitar Institute of Technology alongside well-established jazz icons such as Howard Roberts and Joe Pass. His workshops at GIT were enormously successful and the school was on the verge of hiring Lenny as a full-time teacher. Sadly, Lenny did not have the chance to assume this position. 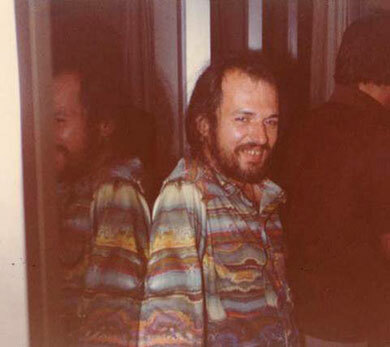 On the morning of August 12th, 1984, one week after his 43rd birthday, Lenny Breau’s body was found floating in his apartment building’s roof top pool. Initially it appeared that Lenny had drowned after a night of binge drinking, an activity in which he indulged occasionally since getting off drugs a few years earlier. Within hours, however, the police determined that he had been strangled before being tossed into the pool. Lenny’s wife, Jewel, became their main suspect. Lenny had met Jewel Glasscock in Nashville in 1980 and the pair married a year later. The couple had a daughter, Lenny’s third, whom they named Dawn Marie. Jewel and Lenny’s relationship was tumultuous and difficult. Several of Lenny’s friends told police they had witnessed an enraged Jewel hit and choke Lenny on several occasions. Lenny admitted to friends that he was afraid of Jewel and fled from her several times, staying with friends and family until she tracked him down and brought him home. On one occasion in Nashville, Lenny had taken out a restraining order to keep Jewel at bay. 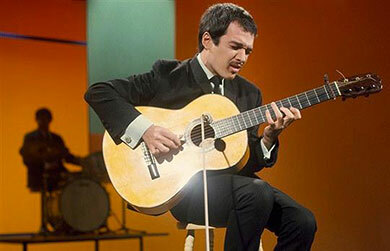 In the years immediately following his death, aside from the memories of friends, family members and die-hard fans, Lenny Breau’s contribution to jazz guitar was overlooked and largely forgotten. Most of his albums were either out-of-print or difficult to find. Although he had produced a book with the help of guitarist John Knowles explicating his guitar style and written many columns for Guitar Player Magazine, his unique approach to fingerstyle jazz and the techniques he developed were not being carried on by a new generation of upcoming jazz guitarists, most of whom had never heard of Lenny. 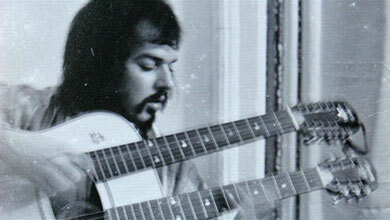 As the years passed, Lenny Breau seemed destined to be at best a minor footnote in the history of jazz guitar. Jazz guitarist George Benson once said of Lenny, “There’s such a thing as being ahead of your time.” This may well be the case because over the past twenty years there has been ample evidence the music world is catching up with Lenny Breau. In 1995, Randy Bachman, a fellow Winnipegger and long-time fan of Lenny’s formed Guitarchives, a recording company devoted to finding, remastering and distributing Lenny Breau’s unreleased or out-of-print recordings. Guitarchives releases, including Boy Wonder (compiled from tapes made of Lenny at Event Records) and Live at Bourbon Street were well-promoted and began to spawn a new fan base for Lenny’s music. In 1999, Lenny’s daughter Emily Hughes put together a well-researched, detailed and artfully wrought documentary chronicling the life and music of her father, which appeared on the Bravo network. This documentary inspired me to write the biography, One Long Tune: The Life and Music of Lenny Breau (University of North Texas Press, 2006). In 2000, Lenny’s close friend and master fingerstyle jazz guitarist, Stephen Anderson, published Visions, an in-depth instruction book on Lenny’s style. Another record label, Art of Life, founded by Lenny Breau fan Paul Kohler made available more unreleased and out of print recordings including The Hallmark Tapes, the earliest recorded examples of Lenny’s jazz guitar playing. Lenny’s techniques, particularly his chordal harmonics, began to show up frequently in the playing of guitarists such as fingerstyle virtuoso Tommy Emmanuel who said of Lenny “To this day, there is no one in the world who can do what Lenny did and we are all indebted to his legacy.” Lenny was posthumously inducted into the Canadian Music Hall of Fame in 1997 and nominated for a Juno Award—Canada’s equivalent of the Grammy—in 2015. 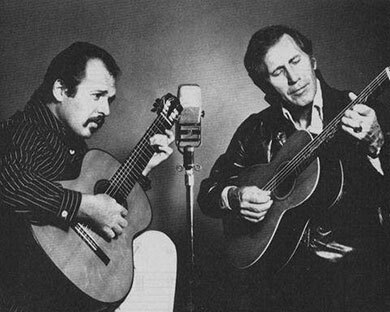 Chet Atkins called Lenny Breau (1941–1984) “the greatest guitarist who ever walked the face of the earth.” Breau began playing the instrument at age seven, and went on to master many styles, especially jazz. Between 1968 and 1983 he made a series of recordings that are among the most influential guitar albums of the century.